London: Printed by Order of the Society for the use of the Members, By W. Bulmer and Co. Cleveland-Row, St. James's. 1814. Full title: 'Report of the Committee of the Society of Dilettanti, appointed by the Society to superintend the expedition lately sent by them to Greece and Ionia; containing an Abstract of the Voyage of the Mission, a List of the Materials collected by them, and a Plan to facilitate the Publication of those Materials.' At end of last page: 'Signed, by order of the Committee, | H. C. ENGLEFIELD, | Secretary.' + 18pp., 4to. Stabbed, but with stitching gone. [ Mitchell S. Buck, American classicist. ] Typescript of his novelette 'Rose of Corinth', inscribed to its illustrator Franz Felix, with covering Autograph Letter Signed ('M S B') from Buck to Felix, regarding arrangements for illustrating the book. Typescript without place or date. Letter on letterhead of Vapor Engineering Company, Philadelphia. 10 September 1928. Both letter and typescript in good condition, on lightly-aged paper. In envelope with three postmarks between 9 and 11 September 1928, addressed 'For: Franz Felix, Esq. | Apt. 3-c | 790 Riverside Drive, | New York City.' LETTER: 1p., 4to. He explains that he is sending the 'MS' [sic] that day by registered mail, and asks Felix to keep it 'strictly confidential for the present', adding that he has 'not even told Mr. Brown [his publisher] what it is about'. If Felix has time to 'make up a sketch' Buck will collect it and take it to Brown. The first letter dated from the Traveller's Club [London], 3 February 1863. The second letter from 74 Gower Street [London], 19 December [no year]. Both letters 2pp., 12mo, and both in good condition, on lightly-aged paper. The two items glued together along one edge. Letter One (3 February 1863): He is enclosing an account of her 'chiffres' from his colleague at the British Museum Vaux, and hopes they 'will be what you want'. He asks for more information regarding 'the drawings', and condoles with her on her husband's ill health: 'This has been a very unhealthy season.' Letter Two (19 December): Regarding his wife having the measles, which makes it impossible for them to accept her invitation. [Sir Edward Malet, British diplomat.] Autograph Note Signed ('Edward B Malet') certifying the signature at the foot of a document in French, by 'Monsieur Persiani 1st. Secretary of the Russian Legation at Athens'. The Persiani document on the letterhead of the 'Légation Impériale de Russie', Athens, 25 January 1875. 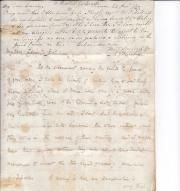 Malet's note without date or place. The document is 1p., 4to. It is in fair condition, on thin aged paper, with the remains of two red wax seals, and backed with paper. With the receipt stamp of the London & County Bank. The letter is in French, and signed 'Persiani' and relates to a payment from the Russian exchequer, drawn on Baring Brothers of London, to Alexandre Mintshaki, son of 'Son Excellence Mme. Sophie Mintschaki, défunte'. Malet's note reads: 'I certify the above to be the signature of Monsieur Persiani 1st. Secretary of the Russian Legation at Athens. [Book; poem] To Prosperous Hellas. A Forecast. 28pp., 8vo, unopened, paper wraps with damaged cellophane cover (some loss), damage to top of spine,mainly good condition. Dedicated to Philip Ivanoff and the the Shareholders of Thracian Mineral Products Ltd: "One day an alchemist walked o'er the land [...]" No other copy recorded. Autograph Manuscript, by the Scottish romantic poet Thomas Campbell, of his essay 'Remarks on the Geography of the Ancients'. 32pp, 8vo. In very good condition, on lightly-aged laid Whatman paper with watermarked date 1830. Ruled in pencil by Campbell, and written out in his attractive calligraphic hand. With occasional emendations, and with an entire revision of the twentieth page made by overlaying another leaf of paper over the top of the original with wafers in each corner. (The two versions can be separated from one another with ease.) Campbell's essay was the leading article in the first issue of 'The Metropolitan', published in London by James Cochrane and Co.
Delicate pen drawing of a carved inscription in Ancient Greek set into an outside wall with foliage, above a drinking fountain of a carved face and conch, depicting a feature of Villa Crawford. and presumably made by F. Marion Crawford himself. 12, 1p. On bifolium. In black ink over pencil. Very good, on lighly-aged paper. Presumably a representation of the Roman wall fountain which could be seen when looking down from Crawford's bedroom at the Villa. 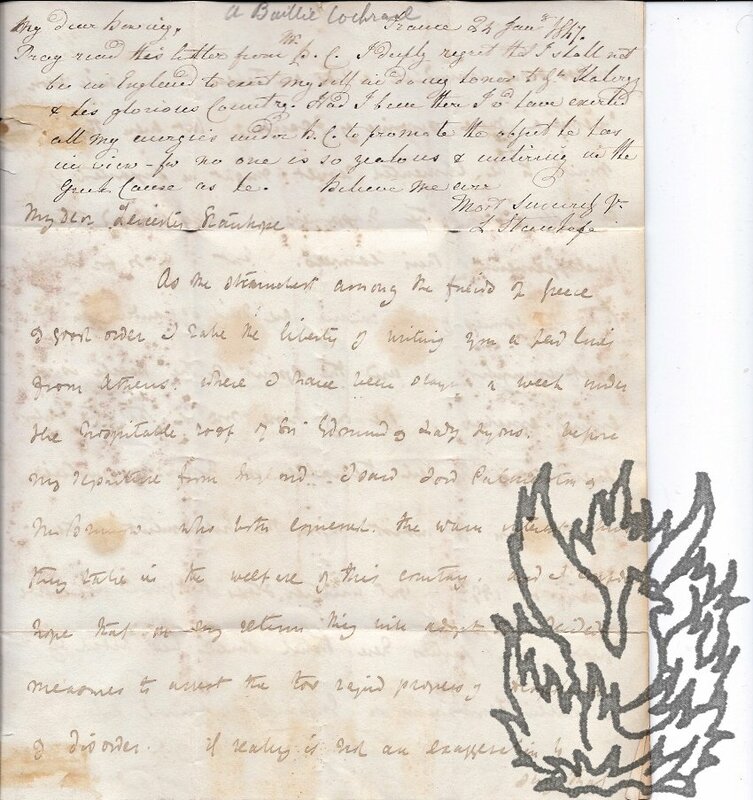 The present item consists of a pen drawing, roughy 18 x 9 cm., covering the left hand side of a letterhead (the printed address being in the top right-hand corner). The drawing is detailed and attractive, in a late nineteenth-century style, showing a four-line inscription in Ancient Greek on a tablet set into the wall above the drinking fountain. [Printed pamphlet.] The Case for the Cretans. Being a Translation of the Memorandum addressed by the Cretan Government to the Consuls of the Protecting Powers, on May 29th, 1910. London: J. Davy & Sons: The Dryden Press, 8-9 Frith Street, Soho Square, W. 1910. 32pp., 8vo. In original printed wraps. Stitched. In fair condition: dusty and lightly-aged, with minor creasing. Described on p.5 as 'a new translation of the Memorandum presented to the protecting Powers by the Executive which, since the departure of the second Greek High Commissioner, has been governing Crete under obvious difficulties, but with conspicuous success'. The 'Copy of Letter from Monsieur E. Venizelos to Sir Charles W. Dilke', dated 'Canea. 13/26 July, 1910', is on p.3; and Dilke's introduction on pp.5-12. Autograph Letter Signed written from Greece by the Scottish historian George Finlay to a 'dear Cousin' [of the Haldane family] in Scotland, including descriptions of 'repeated shocks of earthquakes' and of an agitation for war against the Turks. 4pp., 12mo. Bifolium. Fair, on lightly-aged paper. He is delighted that 'any thing should induce you to send me even the few lines you have written', and declares that he will 'always be most happy to do anything in my power to serve any friend of yours, and not the less that the name of Gairbraid and all its pleasant recollections is connected therewith.' He asks for news of the recipient's health, and that of 'my aunt Mrs Haldane'. The summer in Greece has been a hot one, and 'the people of Athens are kept in a state of alarm by repeated shocks of earthquakes. 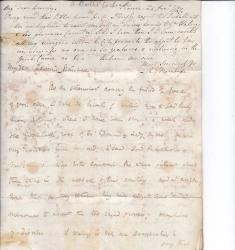 Printed 'Copy of an Order in Council dated 16th November 1827, relative to the Protection of the Trading Vessels of this Country from Greek Pirates', with autograph signature of Charles Andrew Scovell. 1p., folio. On laid paper, watermarked 'CLARKE AND HORSINGTON 1825'. Disbound. Fair, on lighly-aged paper with creasing to the top outer corner. The central part of the page carries the 39-line Order in Council, signed in type by C. C. Greville, and headed 'AT THE COURT OF ST. JAMES'S, | The 16th Day of November, 1827, | PRESENT, | The King's Most Excellent Majesty in Council:'. Autograph Letter Signed Alexander Baillie Cochrane to Leicester Stanhope, soldier, on Greek affairs; with added note from Stanhope to Dewing..
France, 20 Dec. 1846 [24 Jan. 1847]. Four pages, cr. 8vo, handwriting faded but readable, folded, foxing/staining, some damage, some crudely repaired, marginally affecting text (two words lost). Baillie Cochrane discusses a visit to Greece and the political situation in Greece from the point of view of a Philhellene. Letter addressed to The Honble. Mr. Leicester Stanhope, Ashburnham House, Kensington, Chelsea, London. Added at top of letter: France 24 Jany. 1847 | My dear Dewing, | Pray read this letter from Mr. B. C. I deeply regret that I shall not be in England to exert my self in doing honor to Gl. 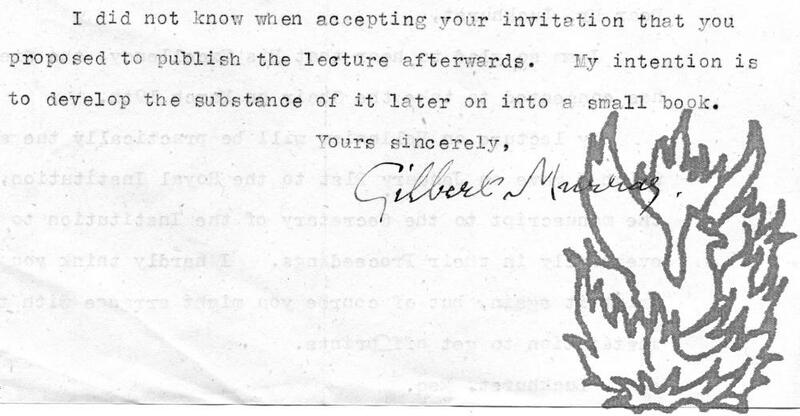 Typed Letter Signed ('Gilbert Murray') to K. W. Luckhurst, Secretary, Royal Society of Arts. 13 February 1941; on embossed letterhead of Vatscombe, Boars Hill, Oxford. Landscape 12mo (12.5 x 20.5 cm), 2 pp. Good, on lightly-aged and creased paper, with pinhole to one top corner. Concerning a meeting at the Society, Murray is 'so glad to hear that His Excellency, the Greek Minister has consented to take the Chair'. 'My lecture on Hellenism will be practically the same as that which I gave on January 21st to the Royal Institution, [...] I hardly think you will wish to print it again, [...] I did not know when accepting your invitation that you proposed to publish the lecture afterwards. Islamic News [became The Muslim Standard] WITH: Muslim Outlook. Islamic News [Second Year of publication] Nos. 3, 19-24 inc., 28-38 inc.; as The Musliim Standard Nos.1-5 [39-43] inc., total 22 issues. A little staining, some edges dusty, some minor damage, mainly good. Subjects: "Strangling of Palestine, Muslim persecuted in India; letters; Palestine; Jews; Turkey; Turkey and Greece at War; Afghanistan; British attitudes; Khyber Railway; Anatolia; assassinations; India; Curzon v. Tchitcherin. WITH: "Muslim Outlook" no. 51 ONLY, London, 7 Oct. 1920, published by the Islamic Information Bureau (perhaps more hardline that the former, eg.